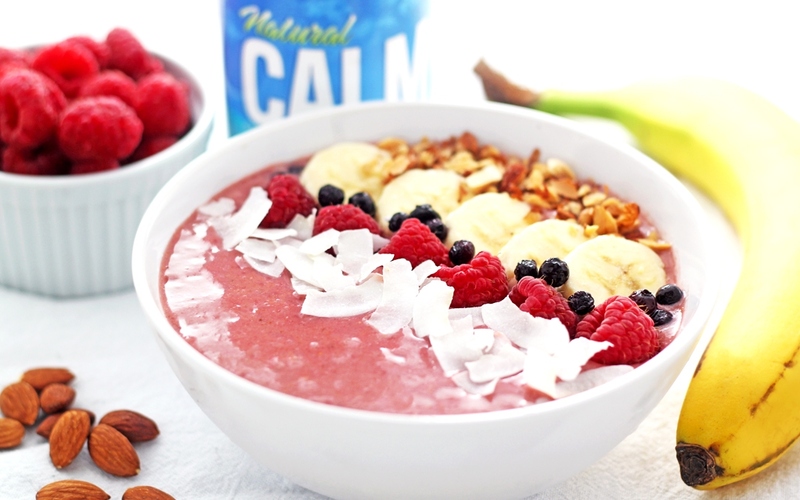 By Calmful Living Kitchen Smoothie bowls are a great way to take your smoothies to the next level! Smoothie bowls turn a smoothie into a meal by creating a thick smoothie base and adding your favorite ingredients on top. This recipe is loaded with ingredients high in anti-inflammatory properties to help get rid of those aches and pains! And if you love green smoothies, add 1 cup of your favorite fresh greens to this recipe for an extra nutritional boost! Prep time: 5 mins Cooking time: 0 mins 1 serving Ingredients 1 medium frozen banana, chopped 1 cup frozen raspberries ¼ avocado 1 cup nondairy milk of choice 2 teaspoons Natural Calm Raspberry-Lemon flavor Toppings of choice (fresh fruit, chopped nuts, coconut flakes, etc.) Directions 1. Add banana, raspberries, avocado, milk and Natural Calm to a blender. Blend until smooth. 2. Add toppings and enjoy immediately!